Posted February 26th, 2019 by courtney shapiro & filed under Rome. This post will cover some of the most interesting things you can do in Rome throughout the month of April. Now that spring has sprung, you can expect to find a lot more to do in this ancient city. We will also include several free events, nighttime attractions, and family-friendly activities. The following section will provide information about some of the best things to do in Rome in April. Whenever possible, we will make a note if any of these activities are either family-friendly, free to enjoy, or fun after the sun goes down. With the sun peeking out from behind the clouds, this may be a good time to spend some time among the ruins of the Roman Forum and Palatine Hill – both of which are included with tickets to the Colosseum. This is also the month of Easter, so it’s a great time to visit both St. Peter’s Basilica and the Vatican Museums. Just keep in mind that both locations will likely be very crowded during this time. Don’t forget that some of the best attractions and activities available are actually included at a discount with several Rome tourist passes. April is a great time of year to visit the famous landmarks of this ancient city. Thankfully, there are a lot of great tours you can take which will take you to these locations. Some of these are actually pay-what-you-want tours, so you don’t have to worry about your budget. In addition to these services, there are also tours specifically aimed at younger audiences. If you’re looking for something to do with your kids, this is an excellent opportunity to ensure they get the most out of their trip to Rome. If you’re looking to save money, consider taking either a self-guided or an audio tour of Rome. Both of these services are entirely free to enjoy, so you don’t have to worry about spending any money on either activity. Posted January 23rd, 2019 by Justin & filed under Rome. In this post, we will provide a selection of great activities you can safely enjoy in Rome with your kids. In addition to our top 10 ideas, we will also include several free things to do and fun nighttime attractions. Below that, we will provide a list of great family-friendly restaurants and museums that your children might enjoy. This section will cover our top 10 activities to enjoy with your kids in Rome. Whenever possible, we will make a note if any of these attractions or events are either free or fun after dark. There are a lot of very popular attractions in Rome that your kids might enjoy. One of the best examples is the Colosseum, and admission to this famous landmark includes access to both the Roman Forum and Palatine Hill. Alternatively, you may also want to consider a trip to the Vatican Museums, which include a plethora of historic artifacts, artwork, and sites such as the Sistine Chapel. If you’re looking to save money on some of the most kid-friendly attractions in this ancient city, you might want to think about getting a Rome tourist pass. There are several sightseeing tours in Rome that are great for kids. Some tours are actually aimed specifically at younger audiences, and others are easy for children to use. Family tours of Rome typically cover the most notable sites in the city, including landmarks such as the Pantheon, the Colosseum, Piazza Navona and more. Some services include food and others will give your children a scavenger hunt to perform. Alternatively, you can also take a hop-on-hop-off bus tour. These services will take you to each of the major historic sites in Rome, and they include an audio tour in English and several other languages. If all else fails, there are also pay-what-you-want walking tours of the city centre. These may not be specifically focused on younger audiences, but they are quite affordable. There are a lot of great museums that kids can enjoy in Rome. One of the best examples is the Explora Children’s Museum, which has a lot of great hands-on exhibits for children. Due to its location right down the street from Villa Borghese, there are several additional attractions for kids in the area. Children might also enjoy a trip to the Wax Museum, which features a lot of notable figures from pop culture and history. Alternatively, VIGAMUS is a museum all about video games, a subject that most kids will love to learn about. If your young ones are the creative type, you might also want to take them to the Leonardo da Vinci museum which features dozens of his most famous inventions. For even more great locations to visit, make sure to read our list full of family-friendly museums. There are quite a few great theatres in Rome that offer performances aimed at younger audiences throughout the year. One of the most notable examples is Teatro dell’Opera, which often has classic shows such as Pinocchio and Swan Lake throughout the year. If you want to introduce your children to some of the most beloved tales of all time, this is definitely one of the best venues in the city. In addition to this theatre, you may also want to take a look at the musicals provided at Il Sistina, which often include titles such as School of Rock, Peter Pan, Mamma Mia and more. Alternatively, you might also want to check out Teatro Manzoni, a venue which focuses primarily on comedies and shows aimed at kids such as the Wizard of Oz and The Little Mermaid. If you’ve got younger kids, you might want to consider visiting the San Carlino Puppet Theatre. This location provides a variety of great puppet shows throughout the year. They’re located on the Southern end of Villa Borghese and just a few blocks away from the Explora Children’s Museum. If you want to see what’s playing when you visit, make sure to check our monthly things to do posts. 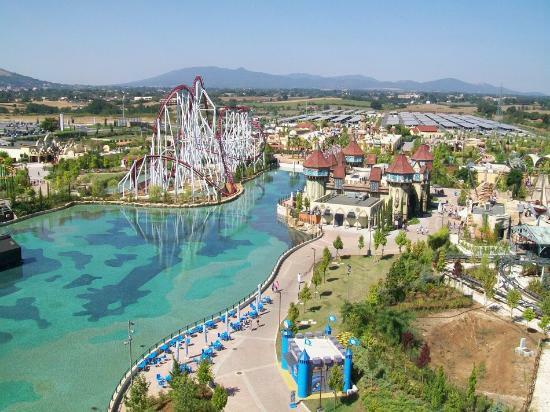 Located just outside of the city, this popular amusement park is one of the best places near Rome for kids and their families. They have a variety of amusement rides to enjoy including roller coasters, carousels, bumper cars, Ferris wheels, a log ride, a haunted house and more. With so many things to see and do, it would be easy to spend an entire day here. Rainbow MagicLand is about 45 – 60 minutes outside of Rome. There are several ways to get here from the ancient city, but one of the easiest methods is either to take a train or a shuttle bus from Termini Station. For more information about this option, make sure to read our post about Rome metro and bus services. Rome is home to a few different teams, and there are usually at least a few sporting events to attend no matter when you choose to visit. Their most popular clubs are the football teams AS Roma and SS Lazio, both performing at Olympic Stadium. If your kids are soccer fans, this could be a great activity for them. Alternatively, there is also an arena designed specifically for Tennis events which hosts at least a few tournaments every year. There is also a venue in Villa Borghese called Piazza di Siena where they host equestrian contests. Children who love horses will probably be interested in seeing these events! For more details about what’s going on in the world of Roman sports, make sure to check our monthly things to do posts. It probably won’t surprise you that one of the biggest cities in Italy is known for their pizza. This may be one of the most popular food options for kids in all of Rome. As a matter of fact, you can actually take a cooking class at Eataly (near Appian Way) where your family can learn how to make a traditional Italian pizza! After you’ve had something to eat, head to a gelato shop for one of the best desserts in all of Rome. There are a lot of different businesses in this city that sell this delicious treat, and most of them have a variety of different flavors. 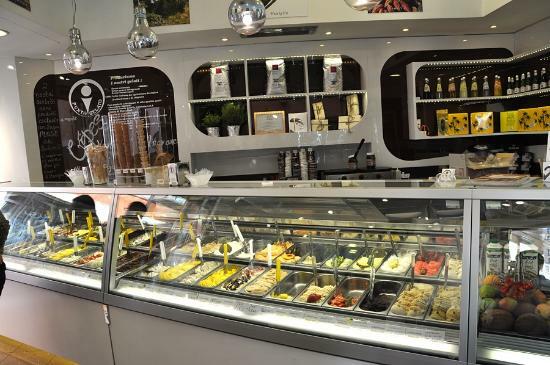 As a matter of fact, chances are you’ll discover something new and interesting to try at every gelato shop you visit. If you’re wondering where to get the best food in this ancient city, make sure to read our list of great kid-friendly restaurants below. As we mentioned before, this is one of the best places to visit in Villa Borghese. Located at the Northeastern end of the park, there is plenty to see and do at Bioparco di Roma. Your family can expect to see a variety of animals including parrots, alligators, camels, kangaroos, monkeys, elephants, emus, gazelles, and even a komodo dragon. In addition to all of the wildlife on display, admission to the zoo includes access to the MACRI museum of environmental crimes. While the focus of this location may be a bit too sad for younger children, older kids and teens might want to check it out. As if that weren’t enough, this zoo includes a conservation center dedicated to reptiles, amphibians and invertebrates. Most of the animals they have in this building were confiscated by the police and donated to Bioparco di Roma. Finally, although it’s not directly tied to the zoo, there is a Museum of Zoology nearby which may be of interest to visitors both young and old. There are a lot of exhibits on display which cover a plethora of different animals. You can learn more about each of these attractions/activities by reading our section focusing on free things to do with your kids. You can also find out about free events during your trip by reading our monthly things to do posts. For more information about these activities/attractions, read our section covering things to do with your kids at night. Don’t forget to check our monthly things to do posts for nighttime events (concerts, musicals, operas) taking place during the time you choose to visit Rome. Needless to say, there are a lot of fun attractions you can visit either for free or at a discount with one of the many passes available in Rome. For more information on each of these services, make sure to read our full post about choosing the right Rome tourist pass. In the following section, we will cover a variety of fun activities you can enjoy for free with your kids in Rome. If you’re looking for even more great things to do that won’t cost you anything, make sure to check our other sections for ideas such as stargazing, sightseeing tours and more. Visitors who are working with a budget may want to consider getting a Rome tourist pass, which will allow you to save a lot of money while enjoying some of the most popular attractions in the city. There are a lot of wonderful pieces of historic art located throughout the city of Rome. While much of this artwork can be found in museums and palaces throughout the city, tickets are typically required to enter and see the various exhibits. These are just a few of the more notable examples of artwork that you can see for free in Rome. If your kids have an interest in the art world, this is an excellent opportunity to introduce them to work from some of the most important artists in human history. There is a church standing atop Aventine Hill with an excellent view of St. Peter’s Basilica. Unfortunately, this area is actually closed off to the public with a gate on one side of the basilica. That said, there is still one way to see the dome of St. Peter’s from this location, and that is by looking through the keyhole of the gate. The view from this keyhole lines up almost perfectly with St. Peter’s Basilica, and on a clear day, it can actually be one of the most interesting and beautiful ways to see the church from afar. This keyhole is at the perfect height for kids, and it’s a free activity that you can enjoy while you’re in the area. 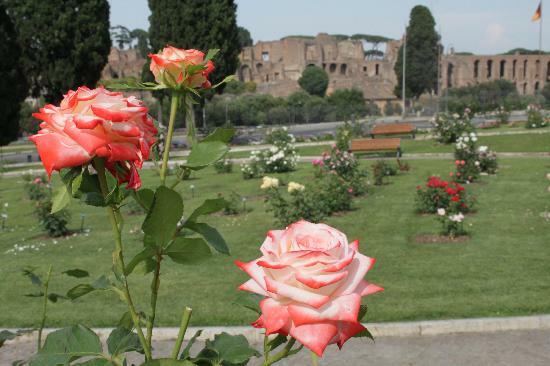 Aventine Hill is also the site of the Roman Rose Garden and the Orange Tree Park. At the bottom of the hill, you’ll find the famous Circus Maximus, which is yet another historic location you can visit for free! NOTE: If you’re looking for another great view of St. Peter’s Basilica, consider making a trip to Castel Sant’Angelo. The roof of this building is open to visitors and they offer free admission on Domenica al Museo. Alternatively, you can also save money on tickets with a Rome tourist pass. If your kids love cats, chances are they’ll jump at the opportunity to visit this historic sanctuary for the feline kind. Located at Largo di Torre Argentina, a site near the location where Julius Caesar was killed, these ruins have since become home to a colony of cats. Visitors are welcome to come and see these kitties for themselves and perhaps even spend some time with them. There is an adoption center nearby which provides an invaluable service to these cats. While they do request a donation, you don’t have to pay anything to visit the Roman cat sanctuary and enjoy the company of a few feline friends. TIP: The Roman cat sanctuary is just down the street from Piazza Venezia, which means it’s pretty easy to access. This plaza is also close to the Altar of the Fatherland and Campidoglio, two of the more notable sites on our art walk. While there have been talks of ending this program, chances are that many museums will continue to offer free admission on Sundays simply because it has become such a popular activity in Rome. That said, it is important to keep in mind that some of these locations may change their approach to Domenica al Museo in the future. TIP: Many of these historic sites and museums are included either for free or at a deep discount with a Rome tourist pass. If you don’t manage to visit the city during the first Sunday of the month, this is one of the best ways to save money on admission. There are a lot of great fountains to see in Rome, and some of them are actually popular places for parents to take their children. While we’ve mentioned a few of these sites in our art walk suggestions, there are many more locations you may want to consider. The Turtle Fountain – Located about a 5-minute walk from Piazza Venezia, this fountain features several turtles atop the water basin with a few additional sculptures beneath them. If your kids like amphibians, this is definitely one site they will want to see. Barcaccia Fountain – Designed by Pietro and Gian Lorenzo Bernini, this fountain has the appearance of a small boat which has all but flooded. Although the vessel appears to float above the water of the main basin, there is a second basin inside of the boat which creates an interesting visual effect. 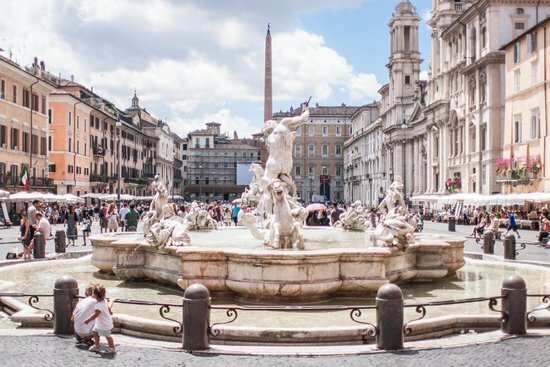 You’ll find this kid-friendly fountain near the Spanish Steps. Fountain of Neptune – Found at the Northern end of Piazza Navona, this famous fountain includes a sculpture of the mythological god Neptune fighting with an octopus. He is surrounded by cupids, sea nymphs, and horses who seem to jump out of the water basin. Kids will love all the animals and mythical creatures on display. There are many more examples like this, but these are just a few of the more noteworthy examples of fountains that children may enjoy. If you’re looking for even more great locations to visit, make sure to read our list of fountains that are lit up after dark. If you plan to see Rome in the spring or summer, a stop at the rose garden is an absolute must. Not only is it free to come and smell the flowers, but the garden is actually located on Aventine Hill, so you can combine your trip here with a visit to the Cavalieri di Malta Keyhole and Circus Maximus. While it might not be a popular activity for some kids, others will jump at the opportunity to not only see these beautiful roses, but also enjoy the scent of them as it wafts through the garden. If your children are interested in flowers and gardening, this could be an excellent attraction for them to visit. NOTE: If you are visiting in spring and your kids love flowers, you may also want to make a stop at the Spanish Steps. During this time of year, the steps are lined with colorful azaleas that have just begun to blossom. This is also where you’ll find the Barcaccia Fountain which is a popular spot for children. Tempio di Esculapio – The ruins of this beautiful temple are located right in the heart of Villa Borghese and they are surrounded by a beautiful little lake. While you can take a boat across the water for a very low price, you don’t actually have to pay anything to enjoy the sight of this magical structure. Playground – Located just a few steps from the temple, this fun little playground is a great place to take your kids so that they can play in the park and have some fun. Needless to say, it won’t cost you anything to stop here and let your children run around. La Casina di Raffaello – This historic building has been transformed into a municipal playroom for children. They have a library of books, storytelling events, and other fun activities that your kids can enjoy for free. You’ll find this great hidden gem just north of Cinema dei Piccoli, an affordable theatre which focuses primarily on family-friendly films. There are many other family-friendly activities you can enjoy in Villa Borghese without paying much of anything. If you plan to stay in the park for most of the day, you might even want to consider having a picnic. We also provide a self-guided tour which is entirely free to use as you please. TIP: Most of the attractions that require admission in Villa Borghese are actually included with one or more of the Rome tourist passes. This is a great way to save money on tickets for some of the more popular sites in the area. Not to be confused with traditional toy stores, the Bartolucci store is one of the most unique and interesting shops in all of Rome. Rather than focusing on the typical plastic toys we’re all familiar with seeing nowadays, this business still produces all their products by hand with wood. They sell a variety of different sizes of toys, and they even have a few incredible display pieces such as a wooden motorcycle. That all said, the most popular item they sell is traditional wooden Pinocchio dolls. They even have a section of the store called “Geppetto’s Workshop” where your kids can see how these toys are made. Although they obviously don’t offer any free toys, it won’t necessarily cost you anything to enter the store and take a look around. You might want to bring some money along to get something small for your kids, but this doesn’t have to be an expensive trip. If your kids love the story of Pinocchio or they want to see how toys used to be made, this is a great location to take them while you’re visiting Rome. 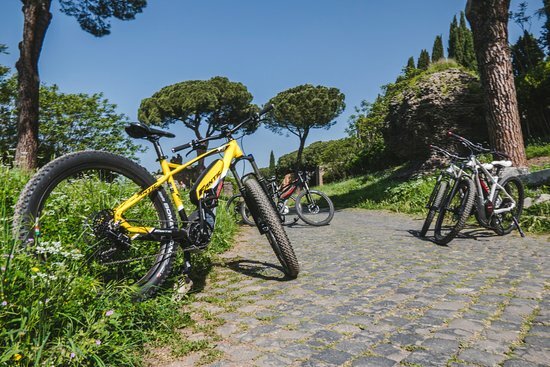 These are just a handful of the playgrounds available in Rome. Most of these locations are free and open to the public. This section will cover a variety of fun activities you can enjoy after dark with your family in Rome. For even more things to do, make sure to check our other sections for ideas such as going to a musical or opera, visiting a museum, or even making a trip to Rainbow MagicLand! If you want to learn about attractions and events that will be happening after dark during your visit, make sure to check our monthly things to do posts. Some of the following activities are included either free or at a steep discount with Rome tourist passes. Trevi Fountain – This is probably the most beautiful fountain to see after the sun goes down in Rome. In addition to being the largest baroque fountain in the city, it’s also one of the best lit structures. Fountain of Neptune – Found at the Northern end of Piazza Navona, the lighting for this structure is a bit less impressive. Thankfully, there are a lot of street lamps in the area that keep everything pretty well lit. Fountain of the Four Rivers – Also in Piazza Navona, this fountain is absolutely beautiful after dark. Lights from the bottom of the basin keep all of the sculptures above bright and easy to see throughout the night. There are several other wonderful fountains that you can enjoy after the sun goes down, but these are the spots you should definitely visit at night. These sites are pretty close to some of the most popular theatres in the city, so you might want to think about visiting a fountain or two after going to see a family-friendly musical with the kids. If you want your kids to learn all about the days of gladiatorial combat in Rome, Gruppo Storico Romano is one of the best places to visit. This arena is designed to look like an ancient Roman stadium, and they actually provide traditional gladiator shows on a regular basis. In addition to the performances, this group also provides a class for children which gives them an idea of what it was like to be an actual gladiator. During this course, your kids will adorn period accurate armor and learn how to fight with swords. TIP: This stadium is close to the ancient Appian Way, which has a lot of interesting landmarks to see. Your family might want to consider taking a walk down this historic road while you’re in the area. There are a lot of great restaurants where you can grab a bite with your kids in Rome, but this might be one of the best places in the city. The Romeow Cat Bistrot welcomes kitties to join you for a wonderful meal. Their menu includes a variety of foods such as pasta, soup, and even tofu for vegetarians. In addition to their meals, this restaurant also provides some great treats for kids. There is also a tasting menu which allows you to try either 4 or 6 courses with desserts, giving you a great sample of everything they have to offer. If your kids love cats, this is one location you should definitely consider visiting while you’re in Rome. Alternatively, you can also go to the Roman Cat Sanctuary for free! The Waxworks Museum – This museum is open until 9 pm and it contains a lot of interesting wax statues of both historical figures and pop culture phenomenons. Chances are that you and your family will find at least a few people you recognize while you’re here! MAXXI Museum – With a variety of different exhibits that appeal to guests of all ages, this is a great place to take your kids after dark. This museum is open until 10 pm on Saturday nights, and they also participate in Domenica al Museo. VIGAMUS – What kid wouldn’t want to visit a video game museum? This location includes a lot of great exhibits focusing on the history of video games. They are open until 10 pm and you can save on tickets with the Rome Turbo Pass. Vatican Museums – If your kids are interested in history, you may want to consider a nighttime visit to the Vatican Museums. With a variety of historic artifacts and artwork on display, there’s plenty for visitors of all ages to enjoy here. These are just a few examples, but there are several other museums your kids might love that are open until at least 7 pm – 8 pm. Make sure to check our list of family-friendly museums for even more great places to visit. Located in Villa Borghese, this wonderful little theatre focuses specifically on movies that are family-friendly. Locals used to call it the “Mickey Mouse” theatre because there was once a statue of the famous cartoon atop the building. Sadly, due to copyright issues, the statue had to be removed, but they still show a lot of great films for kids. Tickets are about average for a movie theatre in Rome, so this activity shouldn’t cost too much. If you’re looking for an alternative, there’s actually another theatre just about a 5 minute walk from here which shows a greater variety of films. This could be a better option for older children in your family. If your kids are interested in learning more about space, you might want to think about doing some stargazing while visiting Rome. There are a lot of great parks where you should be able to get a good view of the night sky, but there are also planetariums in the city which provide an even better look at the stars. Tickets to the Planetarium and Astronomical Museum are included with more than one Rome tourist pass, so you should be able to save money on this activity. In addition to the actual planetarium which is capable of projecting over 4,500 stars, there is also a museum which covers a plethora of useful information about the universe. You’ll find this site just South of Villa Borghese. Should this location be closed, there is another location known as Roma Planetario just South of Termini Station. This is an excellent alternative if you’re looking for a place to see the stars with your kids. In addition to these options, it’s worth noting that the Eataly cooking school provides classes for kids throughout the year. Some of these courses focus on the fundamentals of working in a kitchen, while others will teach your kids how to make some of their favorite treats. You can also take classes covering the best Italian recipes for pizza! Most of these museums close before the sun goes down, but there are a few that have later hours. If you’re interested in visiting after dark, make sure to check our suggestions for museums you can visit at night. If you’re looking for specific events that are taking place during your trip to Rome, we offer a monthly look at various fun activities that you can enjoy with your family. Simply click on the link for the month in question to find more information about what will be going on when you visit. While most of the events we cover in these posts are held annually, some of them may not be available every year. We will make sure to keep these posts updated so that they contain useful and accurate information. Posted January 7th, 2019 by courtney shapiro & filed under Rome. This post will cover a variety of fun and interesting activities that you can enjoy at Villa Borghese. In addition to helping you plan a trip to the area, we will also provide details about how to save money at popular attractions and some of the more notable nearby sites. In this section, we will provide all the details you need to prepare for a trip to Villa Borghese. We will include information about where the park is, how to get there, and the best hours to visit. If you want to know more about a specific location in the park, make sure to visit the respective section for that attraction. If you plan to use public transportation to get here, make sure to read our post about navigating Rome’s metro system. Posted December 12th, 2018 by courtney shapiro & filed under Rome. In this post, we list the many options in Rome for storing your luggage from locker storage at airports and train stations to the growing trend in shared economy “Airbnb-style” storage. This kind of storage allows you to safely leave your bags at certified shops, restaurants, and hotels. The prices are very reasonable and locations are all around the city. Below we cover the different choices you have. TIP: For budget travelers, it is worth considering purchasing a tourist pass. Tourist passes help you save up to 50% off of the retail prices of attractions by bundling several together. To learn more, check out our post comparing the different Rome Tourist Attraction Passes. Now, instead of relying on lockers in inconvenient places, or overpriced luggage storage facilities, you can now drop off your bags at a wide range of shops and restaurants around the city! Nannybag, BagBnB, and Stasher listed below employ a system similar to Airbnb in which you pay a fee to leave your bags at certified locations throughout the city. Posted November 29th, 2018 by courtney shapiro & filed under Rome. If you’re planning on a trip to Rome in January, this post will provide several different ideas for things to do while you’re in the ancient city. In addition to a top 10 list, we will also cover various free things to do, things to do at night and family-friendly activities. The following section will cover our top 10 things to do in Rome during the month of January. Whenever possible, we will note if any of these attractions/events are either free, fun after dark or family-friendly activities. To get an idea of the most popular activities in Rome, check our list of walking tours and bus tours. If you want to see some of the most famous sites in the city, read our posts about going to the Colosseum and the Vatican Museums. Don’t forget that several of the activities below are either cheaper or free with the help of a Rome tourist pass. Posted November 20th, 2018 by canden & filed under A Blog on Visiting New York City, Amsterdam, Barcelona, Berlin, Boston, Charleston, Chicago, Dubai, Dublin, London, Los Angeles, Miami, New Orleans, Paris, Philadelphia, Rome, San Francisco, Washington DC. This post will help you navigate through the myriad of discounts, specials and Black Friday deals for 2018 so you can continue to explore! Keep in mind that our name your own price walking tours are always budget friendly in any of our cities and we have special blog posts to cover visiting on a budget or how to enter certain attractions for free with a tourist discount pass! In addition to great savings on Black Friday, we’ll offer some Small Business Saturday savings to support local vendors we love, and keep an eye out through until next week for what some people are calling Travel Deal Tuesdays! Posted October 10th, 2018 by Justin & filed under Rome. In this post, we will provide several different ideas for fun activities that you can enjoy in Rome after dark. In addition to a list of our top 10 things to do, there will also be sections devoted to free things to do at night and family-friendly attractions you can enjoy even after the sun goes down. The following section features the ten most interesting things you can do at night in Rome. We will note when any of these ideas are also either free or great for families. You should also check our posts about the Colosseum, Roman Forum, Palatine Hill and the Vatican Museums. You may want to consider getting a discount pass for access to the most popular attractions in the city. For more information, please read our post about Roman tourist passes. One of the best ways to spend a night in Rome is to do a little sightseeing. Many notable and historic landmarks in this city are lit up after dark, and you can take a tour which covers the most important locations. You can expect to see sites such as the Colosseum, Piazza Navona, Trevi Fountain and more. There are fully guided tours available from a variety of tour companies, but you can also take a self-guided tour. In addition to both of these options, you might also want to consider an audio tour after the sun goes down. If you’re interested in a guided tour, visit this page for a list of Rome night tours. For additional details about taking a self-guided or audio tour, check our post about free things to do in Rome. No matter when you come to Rome, chances are there will be a concert happening somewhere in the city. The most popular concerts feature classical music being played by symphonies or sung by notable artists such as the Three Tenors. That said, popular musicians also frequently perform more modern hits at various locations around the city. No matter what type of music you enjoy, chances are you’ll find a great concert to attend. If you’re a sports fan, the city of Rome has two excellent football teams to support: AS Roma and SS Lazio. Both teams play in Olympic Stadium at various times throughout the year. No matter when you choose to visit, chances are you’ll have an opportunity to see one of these two teams playing a live game. There are a few companies that offer a dinner cruise on the River Tiber. Considering that this river winds its way right through the heart of Rome, going on a cruise is a great way to see the city. See sites such as St. Peter’s Basilica, Castel Sant’Angelo, the Colosseum and more while enjoying a nice meal. This is also a great activity for anyone who wants to spend a romantic night out with their significant other. For more details, check this list of dinner cruises on the River Tiber. TIP: You can save 20% on cruise tickets with the Rome City Pass. Rome has a wonderful theatre known as Teatro dell’Opera which routinely offers at least a few different operas, ballets, and other shows each month. This theatre usually sticks to the classics, so you can expect familiar stories such as Swan Lake, Carmen, Don Quixote and more. During the summer, Teatro dell’Opera runs a special series of concerts and operas which take place at the Baths of Caracalla. This is a rare opportunity to see a show at one of the most historic landmarks in Rome. If you plan on visiting from May-August, keep an eye out for this incredible opportunity. NOTE: The Rome Turbo Pass offers discounts on admission to operas and the Baths of Caracalla. This is a great way to save money on several different activities. You might be surprised to find that you can actually visit the Colosseum after dark. Several companies offer night tours of this historic site, covering a lot of ground that you won’t even see on the typical self-guided visit. This is an excellent opportunity to see a side of this popular landmark that few will ever discover. Ticket prices can be somewhat expensive, but many reviewers indicate that this experience is worth the additional cost. For more details about this night tour, check our post about visiting the Colosseum. Much like the Colosseum, you can also visit the Vatican Museums at night. This opportunity is usually only available in the spring and summer, and tickets can be difficult to get. Luckily, even if you can’t secure an admission from the Vatican Museums, you might still be able to purchase tickets for a guided night tour from a trustworthy tour company. Night tickets will allow you to visit between the hours of 7 pm – 11 pm. Guests who have taken advantage of this opportunity report that the crowds are much more manageable and not as hectic after dark as they are during the day. To learn more about night tickets, read our post about visiting the Vatican Museums. In addition to Teatro dell’Opera, there are several other theatres in Rome where you can go to see musicals, plays and other live performances. TIP: The Rome Turbo Pass includes discounts on theatre tickets. If you’re planning to use this service anyways, you might want to check and see if you can use it for discount tickets to one of the theatres listed above. If you’re going to be spending some time in Rome, you might want to try an authentic Italian tradition: the Aperitivo. This is a special event which includes drinks and a buffet-style meal. The typical Aperitivo starts at about 7 pm and lasts for a few hours, so it’s a perfect activity to enjoy at night. Visitors from out of town might want to get some guidance from a local. Well, there are several guided tours you can take which will help you to learn all about the Aperitivo. NOTE: This is an excellent idea for a night out with your significant other. There are a lot of great nighttime activities included with the various tourist passes offered in Rome. Here are a few examples of attractions and services you can enjoy at a discount with a Rome tourist pass. If you plan on visiting any of the locations listed above or you want to save money on even more things to do at night, consider getting the Rome Turbo Pass. In this section, we will provide a few additional ideas for free things to do at night in Rome. If you want even more affordable activities, make sure to read our full post of free things to do in Rome. On the first Sunday of each month, museums and historic landmarks around Rome open their doors to the public for free. This event is known as Domenica al Museo, and although some of the included locations close before it gets too dark, there are a few sites with hours as late as 7:30 pm – 8 pm. If you’re looking for something interesting to do in the early evening on Domenica al Museo, consider heading to the top of Castel Sant’Angelo to get a view of Rome during sunset. Locations such as Palazzo Venezia, the Baths of Caracalla and MAXXI are also open until at least 7 pm, giving you ample opportunity to visit as the daylight fades. For a list of additional attractions included on Domenica al Museo, read our post about free things to do in Rome. There are a lot of beautiful and historic fountains in Rome. Many of them are lit up after dark, making them glow and ensuring they are easier to see at night. Since you don’t need to enter any building to see them, you can easily do a self-guided walk and enjoy the most beloved baroque fountains in the city at your own leisure once the sun goes down. NOTE: Trevi Fountain is close to venues like Teatro Sistina, Teatro Eliseo, and other notable theatres. If you’re planning to see a musical, you might want to consider visiting this location either before or after the show. During the summer and fall months, Testaccio Market holds what they call “Open Days.” This is an event where the market remains open late into the night. In addition to the later hours, there are also usually live musical performances and special services offered by businesses in the area. For example, this is the only time that you can get a good cut of meat from the butcher and watch them cook it for you on site! It might not be free if you plan to purchase a few things while shopping at Testaccio Market, but you don’t necessarily have to buy anything to enjoy the music and look around. TIP: This marketplace is pretty close to historic sites like Circus Maximus and the Baths of Caracalla. If you have any interest in visiting either location, consider heading out to these landmarks before going to an Open Day at Testaccio Market. This section will focus on the attractions you can enjoy with your family after dark in Rome. If you’re looking for more ideas, make sure to check our other sections for activities such as Open Days at Testaccio Market, seeing the fountains of Rome, going to a musical, enjoying an opera or heading to a football game. Families who are looking for more things to do at night should consider getting a Rome tourist pass to save money on a variety of popular activities. Even though the age of gladiators has long since ended, there is still at least one location in Rome where you can see a live recreation of gladiatorial combat. Gruppo Storico Romano has a small arena near Appian Way where you can take the family to see a Gladiator Show during the summer. This is a fairly limited event, but it’s definitely an excellent experience if you happen to visit Rome at the right time. In addition to the Gladiator Show, Gruppo Storico Romano also provides something called Gladiator School for young children. This class gives your kids the opportunity to find out what life was like during the period where this type of battle was popular. TIP: If you’re going to be in the area, consider taking a walk down Appian Way. This is a free activity and there are a lot of notable sites to see along this historic road. If you have a family full of cat lovers, a trip to the Romeow Cat Bistro is an absolute must. This is a location where friendly felines will join you for your meal. In addition to serving a variety of dishes earlier in the day, they also offer dinner in the evening. This bistro has some of the most unique and high-quality dishes of any restaurant in Rome, so you can expect a slightly higher price for your meal. It will also be important to make a reservation ahead of time to ensure that you’ve got a table. This is an excellent opportunity for families who are interested in a more classy meal to bring the kids out for a special experience. NOTE: If you’re looking for a more affordable opportunity to spend some time with cats, head to the Torre Argentina Cat Sanctuary. This location is free to visit and there are several happy kitties in the area. At the Northern end of Villa Borghese, you will find Bioparco di Roma. This is Rome’s zoo, and they are open until the early evening during the spring and summer. Although it’s not technically open after dark, this could be a great way to spend the end of the day with your family. While you’re there, you can expect to see camels, kangaroos, crocodiles, emus, flamingos, owls, and many other interesting animals. There are also special events held every month, so make sure to check their calendar before heading out to see if there’s anything going on when you plan to visit. If you’re trying to teach your children how to cook, Eataly of Rome can help with that. Although a majority of their classes are taught in Italian, they do have some courses for children which are taught in English. This is an excellent opportunity to give your kids a fun and educational experience which will make it easier for them to safely help in the kitchen whenever you make a meal. In addition to the basic fundamental cooking courses, they also provide special classes about how to prepare classic Italian pizzas and chocolate. No matter what you or your family like to eat, chances are they’ve got a class that can help you make your favorite food even better. If you still haven’t found an activity you want to do at night, consider one of the following options. These are attractions that we simply couldn’t fit on the top 10, but they are still excellent ideas. For more fun things to do at night in Rome, look into getting a Roman tourist pass. Although they don’t have late hours, this beloved museum does stay open until 7 pm on most nights and until 9 pm on Thursdays. You won’t be able to stay all night, but you can definitely start your evening here without any problem. If you’re going to be in the area on a Thursday, this is a wonderful opportunity to see some of the most famous artwork in all of Rome after dark. Tickets for the Borghese Gallery aren’t too terribly expensive, but you can actually get admission for free or save money at this attraction with the Omnia Vatican and Rome Card, the Roma Pass and other popular Roman tourist passes. In addition to the cooking classes they offer, Eataly also provides wine tasting courses. If you’re in the mood to try some of the finest wines in all of Italy, this is a great opportunity that you won’t want to miss. Wine tasting classes are offered at least once a week, so there’s a very good chance that they’ll have one available while you’re visiting Rome. Some classes focus on white wine, but others provide a variety of red wines to try out. During each course, a professional Sommelier or chef will explain details such as how to taste wine, what foods to pair it with, and how to properly serve it to guests. NOTE: Eataly’s Italian headquarters are very close to Appian Way. You may want to consider taking a walk down this ancient road either before or after your wine tasting class. If you’re in the mood for a spookier experience, consider going to the famous Capuchin Crypt after hours. This is the location of the bone chapel, a famous and somewhat creepy catacomb full of human bones which have been creatively placed throughout the crypt. Some may consider it a bit macabre, but many actually consider this a rather holy place. No matter what your reasons are for visiting, this is an excellent activity that you can enjoy after dark. Several companies provide guided tours of the Capuchin Crypt at night. Check this list of Capuchin Crypt tours and find one that fits both your schedule and your budget. TIP: If you’re interested in visiting this location, you may also want to see some of the other catacombs in and around Rome. Many of them are easy to find on Appian Way. There are several popular rooftop bars in Rome which offer both excellent drinks and an incredible view of the city after dark. No matter which location you choose, the views from above are sure to be breathtaking once the sun goes down. Most of the ancient city will be dark, but chances are that you’ll be able to discern some of the more notable landmarks as they are often lit up at night. Whether you just want a night cap or you’re looking for fantastic views, take a look at this list of the best Rooftop Bars in Rome to find a good place to grab a drink after dark. Even if a trip to the Capuchin Crypt doesn’t sound like the best idea, you may still want to consider taking a ghost tour in Rome. With a history stretching back thousands of years, this city has a lot of creepy tales to tell. On a fully guided ghost tour you’ll learn about some of the more disturbing things that have happened in this ancient city over the centuries. Many of these outings will take you to locations such as the Trajan Forum, the Colosseum and Castel Sant’Angelo. If this sounds like an interesting activity, check this list of Roman ghost tours to find one that fits both your schedule and budget. This post will cover some of the most fun and interesting activities you can enjoy for free in Rome. In addition to a list of our top 10 free attractions, we will also include sections with family-friendly ideas, things to do at night and almost free opportunities. The following section will provide a list of the ten most interesting and fun activities you can enjoy in Rome for free. We’ll make sure to mention whenever any of these ideas are also family-friendly or great after dark. If you’re looking for information about the most popular activities in Rome, make sure to read our post about visiting the Colosseum, Roman Forum, Palatine Hill and our article covering the Vatican Museums. Posted October 1st, 2018 by Justin & filed under Rome. The following post will provide several different ideas for fun activities you can enjoy in Rome throughout the month of December. In addition to our top 10 list, we will also include several free attractions, things to do at night and family-friendly opportunities. In this section, we will provide our top ten list of the best activities in Rome during the month of December. Many of these attractions and events are either free, perfect for families, or great after dark. If you’re looking for help finding the most popular activities in Rome, check our list of walking tours and bus tours. Visitors who want to see the most famous sites in the city should check our posts about going to the Colosseum and the Vatican Museums. Keep in mind that several of the activities below are either cheaper or free with the help of a Rome tourist pass. Posted September 6th, 2018 by Justin & filed under Rome. Located right down the road from Vatican City, Castel Sant’Angelo is one of the most popular landmarks in all of Rome. This post will provide all the information you need to visit the historic building and its museum, including ticket prices, operational hours, and opportunities to save money. This historic location was originally built to be a tomb for Emperor Hadrian and his family and it was finished in 139 AD. Despite its original purpose, Castel Sant’Angelo was almost immediately converted into a military building.